For the next 11 days (or there about) we’ll be suggesting swell gift ideas for nature buffs on your list! Each icon representative of the Twelve Days of Christmas – at the end of the post, see the true meaning of the words to the carol. Since the festive tune features 6 days of birds… we deemed it most appropriate for the season! Stumped for a really cool gift for a bird watcher or gardening type? A gift that might allow some artistic license yet still be totally functional? 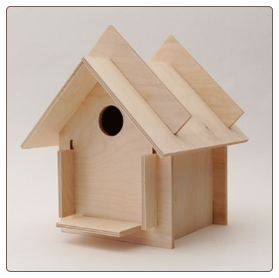 Birdhouse Kits… because some of them have really come a long way! They present a puzzle for assembly (no nails, glue, or screws), the wooden ones like Box for Birds can be painted or stained, and birds really do use them. Not just for nesting in spring but also for cozy roosts on cold winter nights. It’s even a fab way to get someone hooked on birds! Whether original or mod style (deemed the Right, after Frank Lloyd) these kits are hand made in GA by a local company in Athens. Did you say Bull Dawgs? Birdhouse kits are ideal for kids and adults, there’s no age limit or requirement for enjoying feathered friends! 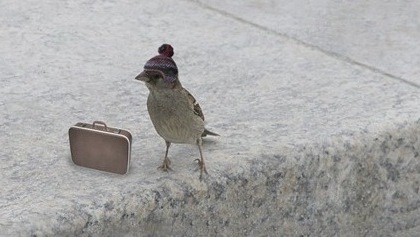 Real estate’s tough out there, so providing housing and shelter does make a difference for local beaked buddies! Two down… 10 more easy & fun gift ideas to come! Oh yeah, the two turtle doves: symbolize the old and new testament. Spring is still months away for most two-legged beings, but for birds it’s the slight increase in daylight hours that sends signals. Instinctively, some of the earlier nesting birds who typically have 2-3 clutches per season, will begin scouting for suitable territory and housing to claim as their own. One of the milder winters of 2012 actually saw bluebird nest starts in February! These cavity-dwelling birds (chickadees, nuthatches, titmice, woodpeckers and others) seek both man-made and natural nesting spots to raise their young. Providing homes for them through birdhouse kit projects makes perfect sense. 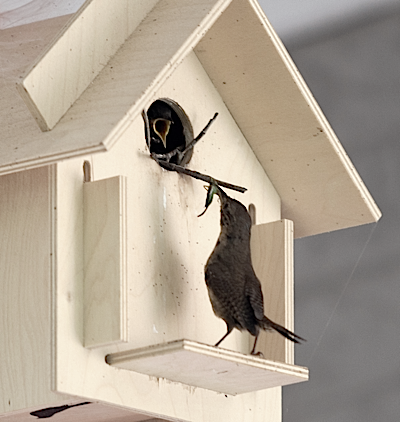 Start now to have housing in place prior to nesting season in spring. The scouts will be on it sooner than than you think! A great class-project for schools, with potential to get kids excited about and noticing some natural yet everyday wonders around them! The sturdy wooden housing offers birds a viable roost for cold nights, as well as an ultimate nest spot for several years. The houses may be decorated or painted incorporating art into the project as well. 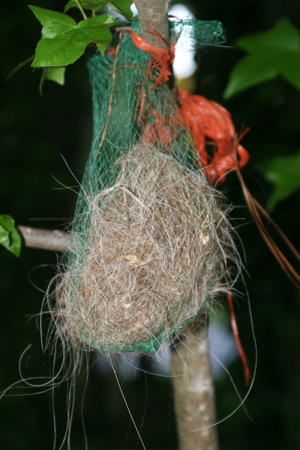 Also as part of the project, kids can gather home-made nesting materials to help lure birds to their new creations. 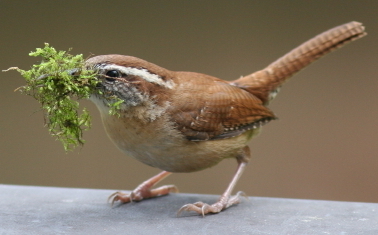 Feathers, and pet hair are favorites, while decorative mosses are heavily used for nest building-even by those birds who don’t use houses. Dryer lint is never recommended because polyester and such are aren’t natural. Should any of the families have horses or if the school’s near a farm… even better because horse hair is a big winner for birds! The mesh produce bags from the grocery store (like the kind apples come in) make ideal holders for the materials collected. This one’s called The Right, a Box for Birds design aptly named after Frank Lloyd Wright’s mod style of architecture. Extremely bird-friendly, and fun, puzzle-like birdhouse kits to assemble, several went out the door as holiday gifts this month. One in particular had a pretty cool story behind it, and the card was signed “Frank Lloyd Wren”. The sender thought it fun to keep the recipient guessing! Turns out our friend is a good friend of the recipient of Frank Lloyd Wren! 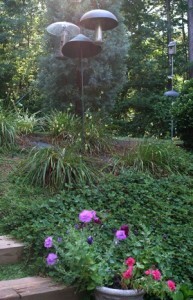 So, to John and Deb: May your new birdhouses host many successful broods over the years! And to the sender, Deb’s sister in TX… great choice! 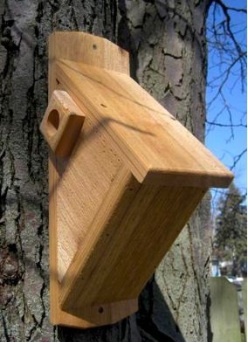 By the way, the Cedar Side Entry Bird House should also entice a nuthatch or two to your place in spring! Though we all may seem to want more, most of us really have what we need. After viewing images of Hurricane Sandy, speaking with friends affected, and really taking it all in… I’m very thankful this year! A roof above, with heat that works. A hot shower with a killer Speakman shower head. A comfortable bed, food in the fridge, pets at home where they belong. Birds to feed in the yard everyday (especially the bluebirds) pesky squirrels, even weeds that need pulling. A business that’s survived some rough times, and oh, the repeat customers are the best, really thankful for them! Distributors who are willing to go out on a limb (thanks Mel and Goldcrest), vendors who have faith, artists who craft such wonderful work. 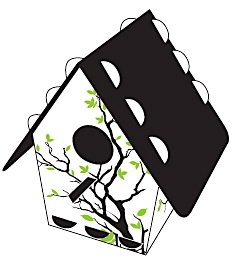 birdhouse kits for winter, spring and fall too! It’s usually spring when most folks think of putting up a birdhouse, or elementary school teachers ponder projects utilizing birdhouse kits. Truth be told… now is an excellent time for a birdhouse kit project! As days grow shorter and temperatures dip, most migratory birds are well on their way to southern wintering grounds. But the hard-core resident birds who brave harsh winters would really do best if they had a place to call home too. Installing a new house not only provides a roosting spot on cold nights, but protection from wind & rain, and from predators as well. Fall is the time to clean out old nests and repair birdhouses if needed. These are high ticket real estate spots for birds during winter. Several birds will huddle together in a birdhouse to stay warm through body heat, and bluebirds especially have been known to do this. Finding a place to roost at night for a bird, is like crawling under your covers at bed time for you. That content, peaceful, and safe feeling you get which allows for your bodies’ rest… it’s universal, with mammals, felines, canines, and even birds! It’s plain instinct. Another way to help birds through winter is by creating a brush pile in a corner of your yard. These piles give birds a helping hand with protection from the elements and from predators, as they can enter the cover and move about through the small spaces. Generally, larger limbs go on the bottom, with smaller branches or twigs piled on top. And the leaves… oh those messy fall leaves – save them for the brush pile! They contain insects that birds will forage on for the next few months (or until it freezes) depending on your locale. They also add cover and shelter to the brush pile. Of course heated birdbaths and stocked feeders will keep resident birds at your residence through the coldest weather if the sources are consistent. Home made suet is fairly easy to make and inexpensive, and a real favorite for most birds during cold weather. But the main thing is to put up the vacancy sign, and let birds know they’ve got some swell roosting spots at your place. Fun birdhouse kits are a great way to do that! By the way, the kit shown above requires no nails or glue. The panels slide together like a puzzle, and it can be stained or painted any way you like. Hey, camouflage is a pretty popular pattern in nature! Please help house the birds! No worries if this one looks a little too mod for your taste, this company offers traditional, and even church birdhouse kits! 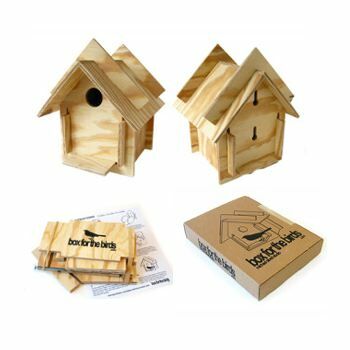 Supporting a cottage industry right here in Athens, Georgia, Box for the Birds has created some of the most innovative and sturdy birdhouse kits to last for many seasons of successful broods, with minimalist and cool packaging too! Fantastic projects for all ages, these kits require no nails, screws or glue, yet they’re super sturdy. Safe for nestlings and little kids too, they’re way fun to decorate. Box for the Birds provides a fine nest site and swell roosting spot during the “off-season” as well. Another fresh and innovative idea are the kits created by Tweet Tweet Homes. 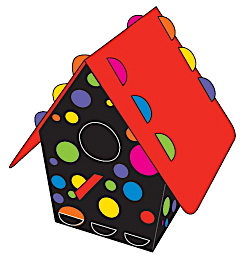 Recycled plastic, in the most vibrant colors, these birdhouse kits also fit together sans the the tools, nails or glue. Warning: you may need to refer to their directions when assembling this fun puzzle! Recycled plastics really do help the environment, and many items let you know just how many milk jugs or containers were used in producing that item. Tweet homes are also available in a traditional house shape, and a newer cone shape version too, delivered flat with barely any packaging waste. 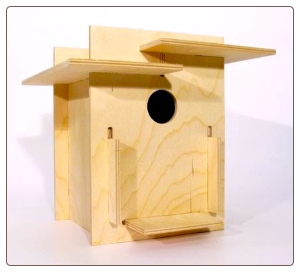 Either with w ood or plastic – half the fun is putting these kinds of bird house kits together, the other half is watching a family being raised and babies when its time to fledge the box! easy bluebird bird house kits fledge successful broods! In the Bluebird Monitor’s forum, there are reports of the first eggs laid in a Florida nest box. Well, this is just exciting news for anyone who’s into Bluebirds because it means that it won’t be too long before the blues are nesting further and further North! 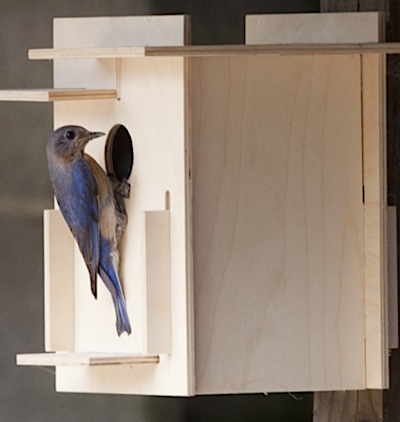 Although Bluebird houses run the gamut from basic wooden box and recycled plastics, to more elaborate, and decorative houses, an important aspect to look for is approval by The North American Bluebird Society (NABS). Maybe you’ve seen that acronym before, and wondered what’s a NABS? Well, that’s who they are, and their website provides great information on attracting and housing Bluebirds. If you’ve ever considered it, but haven’t yet tried… please do! These little brilliant blue birds are amazing, and so family-oriented that it’s just plain cool to have a group in your yard. You needn’t spend a lot either, bluebird bird house kits are available, and some are even NABS Approved. Although it’s difficult to spot in this photo of our yard, look in the upper right corner and you’ll see a bluebird bird house kit that’s been in business for years. It’s mounted on a simple piece of conduit, and does have a baffle added for protection from predators. A tad taller than most recommended heights (5 to 6 feet from the ground), our birds seem to like it just fine. This bird house kit actually fledged three groups of nestlings last season. In the photo it appears to be near the treeline in back, but in reality it stands in open space. That’s another requirement for bluebirds to nest – some open space (which doesn’t cost anything at all). A fantastic reference for all things Bluebird-related is a website called Sialis. I think it’s actually the Latin term for Blue Bird? Virtually any question concerning Bluebirds (and some other cavity nesters) may be found here. It’s well organized and referenced in plain English, so even the novice blue-birder walks away with useful information to benefit our precious “Blues”. With ultra-clean lines and sleek style, these cool birdhouse kits are meant for birds… and the creative process! 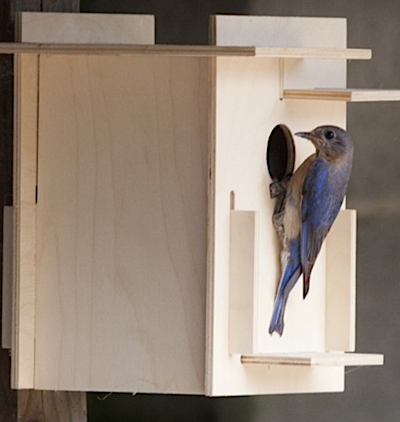 A fun project for kids and adults, the Box for the Birds requires no tools or glue. 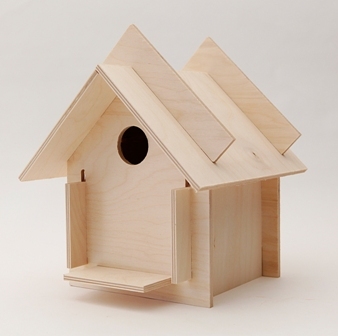 Sturdy wooden birdhouse kits are an excellent medium for creative, and purposeful activity! With a critical shortage in nest sites, (due to increased competition from non-native birds and the decrease in natural habitat) birdhouse kits provide real nesting and roosting spots for feathered friends. This birdhouse kit is called the Right (as in Frank Lloyd Wright) because it’s modeled after the famous FallingWater House in Mill Run, PA. Pretty cool, huh? You can stain, paint, and decorate as desired… the birds will love it, as it’s sure to host many successful broods over the years! Check out the video below of the story behind Box for the Birds. A swell project for kids aged 9 to 99, bird house kits have come a long way from the clunky, boring models of the past. Anything but boring, newer designs work the mind with their puzzle-like assembly. Many requiring no nails or glue, they make fantastic projects for school and youth groups, and real nesting sites for wild birds. Being fanatical backyard birders ourselves, with a commitment to conservation and the environment, you bet we’ll be happy to discount any bulk orders for bird house kits! Several schools have already benefited from this offer, as well as the birds and the environment. For instance: Village Community School in New York purchased over 80 bird house kits for a park make-over last year. Aside from a generous discount, we donated nesting materials, a bluebird book, suet cakes with fun holders, and ideas for easy and inexpensive birdbaths. Together these items helped create a very bird-friendly habitat.